Monday UPDATE: After a string of estimates that missed the mark, I nearly nailed this weekend as Taken 2 raked $50M for the third largest opening in the month of October behind only Paranormal Activity 3 and Jackass 3D. Its PG-13 rating allowed for more clueless families to drag the kids along to witness the dumbed down script violence. Frankenweenie was even more punished by Hotel Transylvania's staying power than I anticipated as it had an excruciatingly disappointing weekend; that's two consecutive busts for Tim Burton with Dark Shadows tank job back in May. Can't wait to see what kind of reception awaits Argo this coming weekend, it's brilliant but will mainstream audiences be able to get past the nebulous title? It was nearly four years ago that Liam Neeson's career got a major - and massively unexpected - upgrade. The looked-like-a-throwaway project Taken hit multiplexes and went on to bank $226M worldwide. From that moment, Neeson wasn't the sideshow, he was the main eventer - since headlining films like Unknown and The Grey. 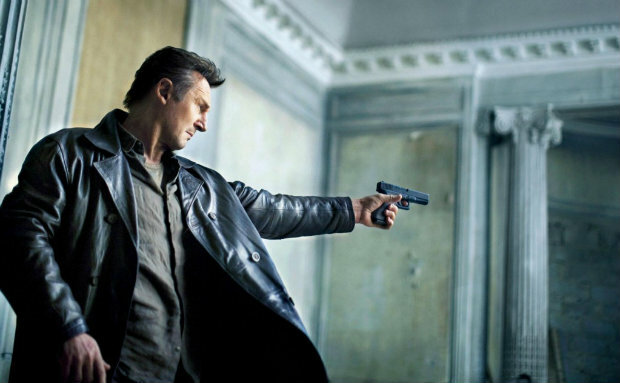 The now 60-year-old returns to the role that began his road to mega-riches with Taken 2. And while it's one of the most laughable "thrillers" you'll ever see, the sequel's guaranteed to crush some massive cash at the box office. Taken 2 $46M - Money estimates range from the mid-30s to the upper 40s, I'll take the higher end of that range but wretched word of mouth is going to mitigate the profits beyond opening weekend. Hotel Transylvania $24M -Went off for a new September record and as Halloween closes in, it could hold stronger than my number. Frankenweenie $19M - While it oozes cred with the name Tim Burton attached, the pieced together pooch will suffer from Hotel Transylvania's staying power. Pitch Perfect $12M - Expands to 2700+ theaters after killing it to the tune of over $5M in just 335 locations last weekend. Looper $11.5M - Outperformed opening weekend but did fanboys inflate the take to the point that its second weekend falls more precipitously than anticipated?